Russian music balalaika ensemble from San Francisco, California "San Francisco Balalaika Ensemble" plays traditional Russian Folk, Gypsy & Classical Music on authentic instruments: balalaika (3 stringed triangular instrument of prima, alto, bass sizes) balalaika-contrabass, domra (3 or 4 stringed round bodied instrument with round back of small, alto and bass sizes), bayan (like an accordion, but with buttons instead of a piano style keyboard). "San Francisco Balalaika Ensemble" is available for weddings, corporate parties, theme events, diplomatic reunions, and concerts. Dancers and singers are also available upon request. 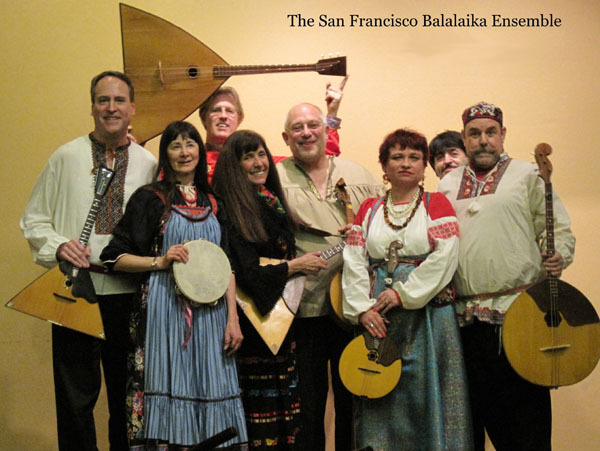 Clark Welsh, founding member, arranger and prima balalaika and domra virtuoso is a native of Marin County, has been amazing audiences for years with his seemingly inexhaustible supply of exotic instruments. He also plays bouzouki, tambura, sax, guitar, cobza, tamburitsa, tambura, oud, bass, and numerous flutes and reeds from Eastern Europe and the near east. Clark has played with Nikolai Massenkoff, Danubius, Hatsegana, Aywah, Troika balalaikas, Neva, Khadra; the San Francisco Pops, Palm Beach Florida, Edmonton Alberta, and Oakland Symphony orchestras, as well as other groups too numerous to mention. Mr. Welsh has performed in the U.S., Canada, Mexico, Korea, Russia, Hungary, and Slovakia. 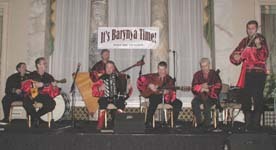 "Grisha" Krumik is bayan virtuoso from Khmelnitski, Ukraine. Mr Krumik studied bayan and piano there, played with the ensemble Pesny I Platz in Ukraine, and came to SF about 8-9 years ago when he started playing with Clark and they have been playing together ever since. Mikel Estrin, founding member, bass domra and bass balalaika player and part time arrange was born on a small island called Manhattan, studied music composition and ethnomusicology across the US and in Europe, and performs on a wide variety of classical and folk instruments. He studied piano, flute, clarinet, saxophone and oboe, and is self taught on bassoon, contra bass, percussion & fretted instruments including baglama, mandolin, viola da gamba, bass, guitars, cavaquinho, ukulele, saz, dumbek and more. Mikel has toured the US and Europe extensively, and performed on stage, screen, radio and concert venues with such well known artists as Melina Mercouri, Georges Geutari, Graham Allright, Steve Lacy, Savopolous, Sidiropolous, and groups including: the Timelords, the Merriweather Consort, Opa, the Californians, the Hellenicks, Bourboulia, Theatracide & Elvis Platine among others. 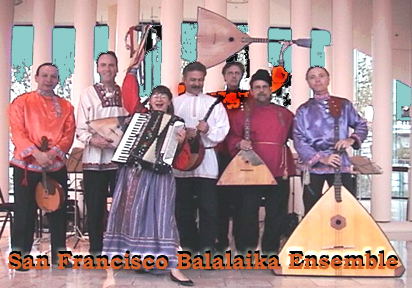 Mikel was instrumental in developing music software including Encore and Music Time, and is a founding member of the San Francisco Balalaika Ensemble, and their Webmaster. Nada Lewis, originally from Stockton, CA, is a founding member of the Silver String Macedonian Band—the first revivalist Balalaika ensemble in California. Nada sings Russian Roma songs, plays alto and cello-bass balalaika and tambourine in the group. Nada was a member of Troika Balalaikas, and a member of the original Klezmorim, Balkan Pacific, founding member of Hatsegana, and currently is accordionist with PANACEA, an East European Folk Ensemble. At one time, she was Music Director of Khadra International Folk Ballet of San Francisco, and now freelances as an accordionist playing many styles of music. Jay Stebley, founding member, playing contrabass balalaika, is also an internationally known cimbalom player. He has performed with San Francisco Symphony many times as well as San Jose Symphony, Berkeley Symphony, Sacramento Symphony and dozens of other groups. As a French Horn and cello player, he has performed with many orchestras and chamber ensemble including the Jefferson Quartet. His compositions have been performed by dozens of ensembles. He lives in Sacramento, CA, his hometown. Anna Razgulova has been playing domra almost all of her life. She graduated from a full time music school (domra class) and continued to participate in all school events even after graduation. She was a member of two folk music groups and toured with them in different regions of Russia. Currently living in the bay area with a full time engineering job and three kids, she hasn’t given up practicing domra. She is member of the San Francisco Balalaika Ensemble, Borvinok and Kedry – a Russian folk music vocal group. Mark M. Rubenstein, M.D. 's instruments were violin, viola, piano and voice (and he built two Zuckerman harpsichords) in his younger years. After a 40 year hiatus he started playing classical mandolin and mandola in the late 1990’s which he continues actively to the present time. He is a relative newcomer to the San Francisco Balalaika Ensemble playing 4-string alto domra. Joshua Cohen's feet rest firmly in classical, jazz and Eastern European music traditions. He plays violin, bass, mandolin, alto and bass domra (and others when called upon!) in various bands and productions in and around the Bay Area. He also conducts and is musical director of the Castro Valley Chamber Orchestra, and Alameda Chamber Music series. He has played in many countries around the world, but makes his home now in Alameda, California along with his (flutist) wife, Genevieve. Lev Zabeginsky - Balalaika virtuoso from New York City. Leonid Bruk - contrabass balalaika player from Brooklyn, New York. New York Balalaika Duo - balalaika player Lev Zabeginsky and Mikhail Smirnov (vocals, garmoshka, guitar). Kalinka Duo - Sergey Vashchenko-balalaika, Vladimir Kaliazine-bayan from Austin, TX. Sasha (Alexander) Ressetar - Balalaika virtuoso from Harrisburg, PA.